I hope we do a good race. And BTW use lauch control in the start of the race, to accelerate faster. I'm leaving now to do some work on my car and ill do my best to come back in time for the race . Results of all Race to the Weekend 40 events are published in the main post. 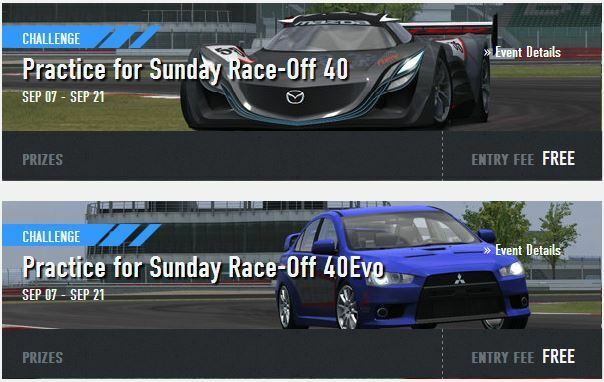 Please have a look, verify and read through the programme of Race-Off that you qualified to (scroll the main post down). They are set to 6 laps for the Furai and 7 for the Evo, so half the distance of longest live race for particular car. My grandfather is very sick and he is in a hospital, so im going to visit him. I dont know if today I can do the race, but if I am not here at the hour of the race, give my place to someone else. In 1 hour i will visit him. I was thinking in one thing. If you put the race of 700-800 to be the last race of all races, MAYBE I can enter in the race. hard to keep up in the fast corners, had to drive like 10kmh slower through apexes than normal. supercar1, I want to say sorry to you because of what happened off track today. I was totally out of my mind when I started to accuse you for what someone else has done, without watching the replay. I made myself look very stupid. anyway in your incident you had nothing to say sorry for, so next time just tell me in my idiot face that you have nothing to do with this. The guy in front of you spun, you had nowhere to go and no time to act. I can understand facts, even if I'm pissed off that much. sorry for the others too, who had to see me going deep down and dirty, next time I'll shut my mouth whatever happens. Learned from my mistake. I don't want to name my divebomber, since he just left without any kind of saying sorry, letting poor supercar take all the blame. I did forgive him last time, but this is something I won't forget for a long time for sure. from now on I'm joining the "raceban" party. if it comes to challenging sro again. "Professional is not a level. It is a state of mind." i joined the chat and first thing i see is that the skillquant rules and broken system that are not allowing me to race, well they can be thrown away in an instant for a guy who is asking first to be allowed in a lower race then asking for timetable being made to suit him then finally the rules are torn up to let this guy into a higher race!!!!!!!!!! great i am now in a good position! i mean he writing to me i can answer ? so quite rightly as i have seen many times before i ask for a restart after all there just was a restart because there was a crash in turn one so another crash in turn there will be another restart right ? and this is meant to be for money ?!?!?!?!? but i had enough of this biased unfair decisions so yes i ask for restart because if there can be one restart for others having a crash why are the rules suddenly different for me ? I hope my grandpa gets good soon. BTW, that someone was Daniel_C? BTW 2: Why do you have a troll face picture? I didn't talk to Jolly at all, so I guess he just seen the public chat messages. You don't have to worry supercar, your driving was clean. and thank you for being so classy ! - Since there are restarts on SRO, i think that need to be a restart for 5 cars that spun, or 1 car that flips, no matter who fault is...in case of mr.jolly, i didn't saw T1, but T2 seems that other car crashes him. - we need working rear view mirrors. lots of crashes happened only because the front runner didn't know where the attacker is. that bull-ear shaped something didn't show nothing what you can use for defence. in real life, you will be dq'd from any race if you try to start without rear view mirrors on your car. if it's not possible to use them, you must provide a rear view camera, sending real-time picture into your cockpit. - race bans. I was against it until now, but after being it's one guy who ruins my sunday race-off 3rd time, I think it's enough. I was very sorry for Romain Grosjean being penalized, cause I like his character, but it was a fair decision and he 'stepped up his game' after that. In long terms, the penalized person profits the most from it. So I assume very little happened today ??? I forgot to ask this random q?---- Is there a schedule for future RTTW s or are we force to wait to edge of our seats for announcement?